A little-known, and seldom seen, U.S. Air Force document of August 1949 details the reported crash of not just one UFO, but two, at Hebgen Lake, Montana. Apparently, there were no less than seven saucers seen in all; a squadron of ETs, some might say. The remaining five, so the tale goes, did not suffer the same fate as the other two. For those who have not heard of the lake, it can be found in the southwest of The Treasure State. It’s approximately 15 miles in length and, at its widest point, stretches to 4 miles. It’s a popular places for campers, those who like to fish, and hikers. The U.S. Geological Survey notes that a powerful earthquake hit the area on August 17, 1959: “This earthquake caused 28 fatalities and about $11 million in damage to highways and timber. It is characterized by extensive fault scarps, subsidence and uplift, a massive landslide, and a seiche [“a standing wave”] in Hebgen Lake. A maximum MM intensity X was assigned to the fault scarps in the epicentral area. The instrumental epicenter lies within the region of surface faulting. Area of perceptibility, maximum intensity, and Richter magnitude all were larger for this earthquake than for any earlier earthquake on record in Montana (from May 1869).” Whether down to coincidence or synchronicity, the earthquake occurred almost 10 years to the day after the curious UFO event I refer to in the title above. A one-page “Incoming Message” from Great Falls Air Force Base, Montana, to the Air Materiel Command at Wright-Patterson Air Force Base, Ohio, tells the summarized story. Dated 17 August 1949, the report notes the following: “This office advised on 9 August 49 that 7 flying discs had been sighted at Hebgen Lake, Montana at 0930 hours that date. 2 of the discs were alleged to have crashed, 1 on the lake, and the other on the opposite shore in a wooded area. 2 agents of this office dragged the lake with negative results. Informant and only actual eyewitness, while absolutely trustworthy, is prone to exaggeration. “He stated discs were all little larger than an auto tire, of a grayish color, and either having a hole in the center or being painted dark in the center. Informant was not capable of estimating speed but agents estimated from description that discs were traveling in excess of 1000 miles per hour. Objects were reported traveling in South Westerly direction. A check of winds aloft for period revealed a generally South Easterly direction and of a maximum velocity of 24 knots per hour. “No unusual atmospheric phenomena were evident on 9 August, sky conditions were clear and visibility unlimited. Informant described sound of object as being similar to a siren. Request advice of detailed report desired.” As well as having dragged the lake, the military undertook additional inquiries in and around the area. They came up with nothing but a definitive mystery, something which leaves us with an intriguing possibility: that at least one of the UFOs might still be buried deep in the mud of Hebgen Lake. Such a thing is not completely out of the question, given the size of the lake. It certainly has plenty of room in which to hide a tire-sized flying saucer. Anybody in the area want to dig into this decades-old affair? 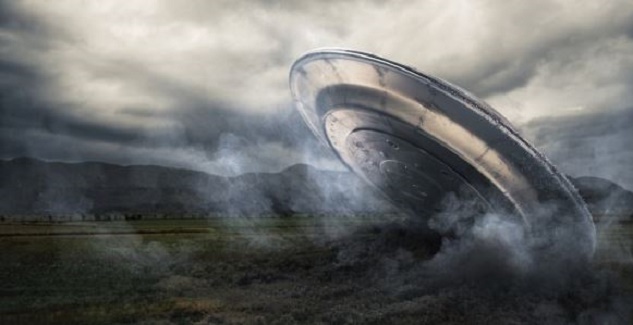 Admittedly, the case is close to 70 years old, was provided by someone described as trustworthy but “prone to exaggeration,” (not a good thing) and the UFO was hardly what can be termed large. But, the Freedom of Information Act, coupled with a review of local newspapers, and a road-trip-style investigation to Lake Hebgen, might cause something to surface. Plus, there are these cases in Montana that might catch your attention, too. NOTE: The above image is a rendering.